Being the first, I hope to win!!! Oh God, what is it with you 'mr sythe' and publicity? and really you got that desperate? mutterings interesting no more. Get a life will you. Can I pleeeeeaaaaaasssssseeeee have the free ticket! Who are The Script? Are they a band? Pleeeeeeeeeeeeeeease can i win??? We are about to leave Oman after living here for 3 years, very sad but hey ho, have to go! Be a great way to leave?? The Script tickets - awesome! If I win - "we cry". 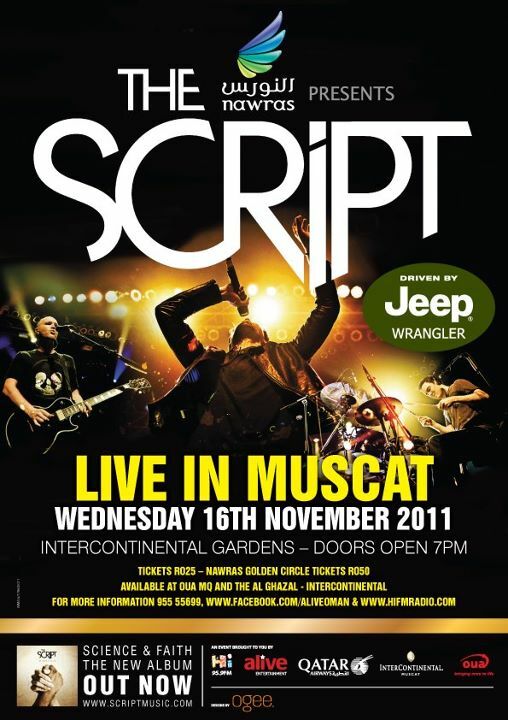 I would be seeing The Script "For the first time" and I would "breakeven"! Poor attempt but best I could do. Here's my entry for free VIP tickets. By showing me The Script! I'm a new girl in town, so would love to feel part of the gang by joining the fun at The Script gig!